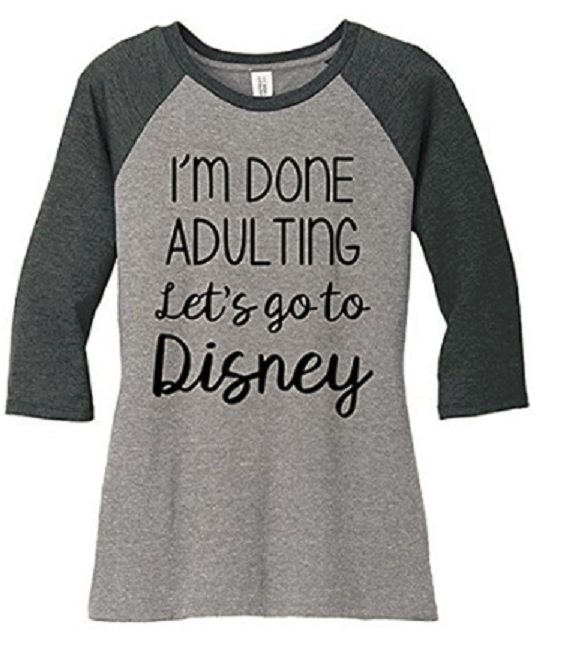 Planning what to wear to Disney World is one of my favorite ways to count down to a Disney vacation. Grab my tips and inspiration for every park! 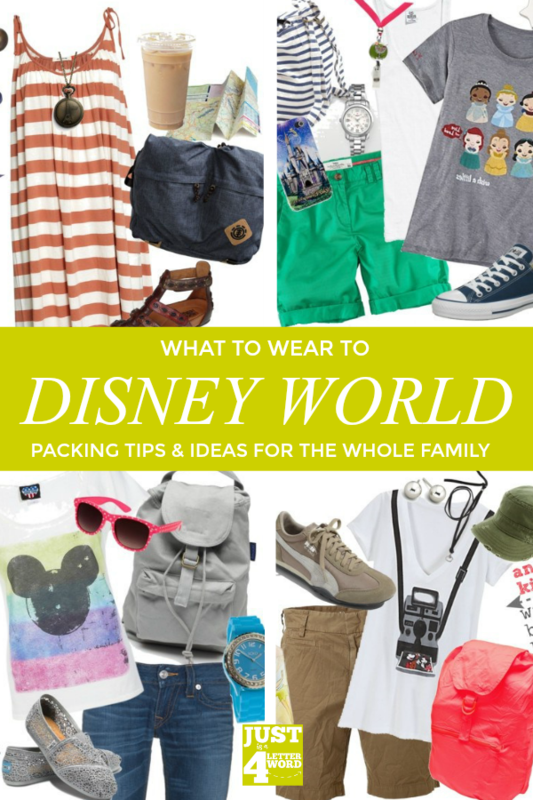 I’m sharing some of my favorite practical and cute ideas for what to wear to Disney World while you’re on vacation, AND how to pack wisely for the whole family so you don’t go overboard! Planning outfits is fun, but no one needs 14 suitcases amirite? Whether you’re packing for a quick trip to Walt Disney World or a week-long vacation, wearing the magic is half the fun! Reminder: my posts include affiliate links, which means I may earn money from purchases made after clicking through. We are a family of four, so the first thing I do when packing for Disney is make a list of what we are actually doing on vacation. I take account of park days, rest days and anything else and decide if there are any special reasons I want to theme our clothing, like the opening of Toy Story Land for instance. 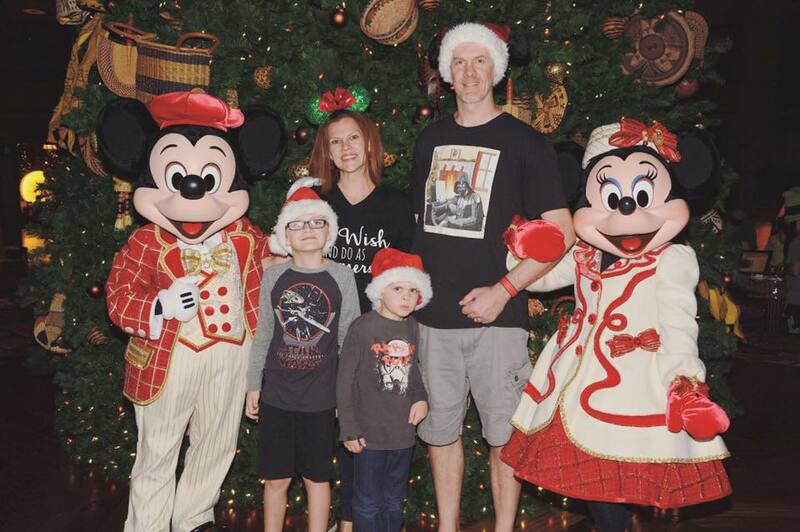 I always want to wear Disney family shirts because it seems so fun! You probably won’t see my family in matching vacation shirts any time soon (not that there’s anything wrong with that), but I do like to coordinate a little bit. For instance, we may all wear something Star Wars themed or maybe red, white and blue for the 4th of July or maybe we all have matching santa hats. You get the idea! But before you can look cute, you have to make sure you are all cool and comfortable. My hope is that my ideas check all the boxes and help make your vacation both fun and fashionable. Magic Kingdom is such a classic park and usually one of our first stops at Walt Disney World. It’s also a big park with tons to do so first on the list is comfortable shoes for everyone. For women: I’ve found that Oofos are the best shoes for standing all day. Other options are Sketchers Go Walks, Converse or New Balance sneakers. If you need something that breathes, try Oofos sandals, Teva sandals or Reef flip flops. For men and kids: we stick to Crocs, New Balance sneakers, or Teva. I like to alternate shoes each day so my feet get breaks in different places. If it’s a long day, you may even go back to your hotel for a break. This is a great time to swap your shoes! Beyond the shoes, I recommend light clothing almost year-round (with the exception of mid-Dec to February when you might want a hoodie on hand). Wear what makes you comfortable whether it’s shorts, skirts, capris or dresses. At Magic Kingdom, I love adding little castle or classic character touches for a bit of whimsy. Fun character tees or necklaces are a super fun way to add some magic to your look. And don’t forget your Mickey or Minnie ears! We are also huge fans of tech shirts and moisture-wicking fabrics. It makes a big difference on the super hot days (think summer) so if you can stay away from cotton, you’ll be much more comfortable! Even if I decide to suffer for fashion, I almost always have my boys in lighter fabrics. 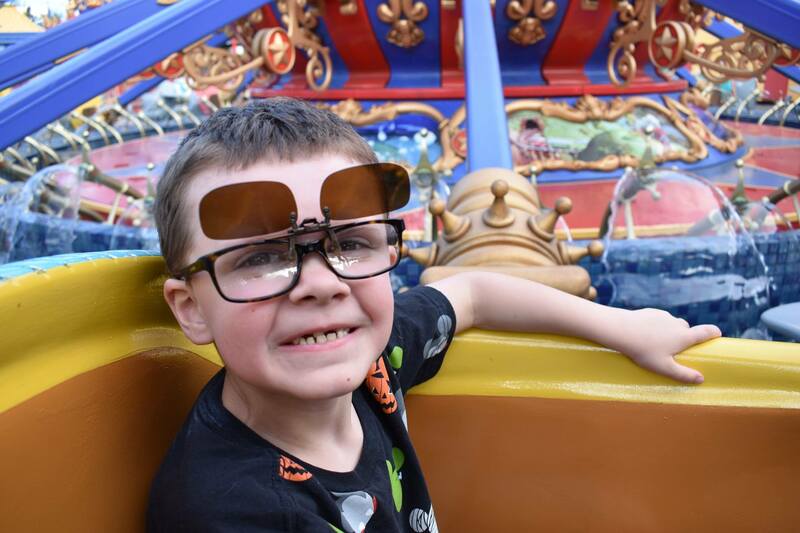 Sunglasses can be a challenge for kids who wear glasses already. We usually go back and forth between having them wear wide-brimmed hats or clip-on sunglasses to protect their eyes from the sun. Bonus cute points! While the footwear situation won’t really change from park to park, I do take a bit of a different approach when it comes to Epcot. This is where you will do allll the walking. You’ll also have longer periods of full sun, especially in World Showcase so I definitely go for tank tops and light dresses here. Since there are fewer rides, I’m less concerned about getting in and out of ride vehicles and more interested in staying comfortable, which for me is a breezy sundress. For the ladies: I highly recommend skimmies shorts any time you wear skirts or dresses. No one needs their legs rubbing together all day. And don’t worry if you think they will make you warmer, they won’t! 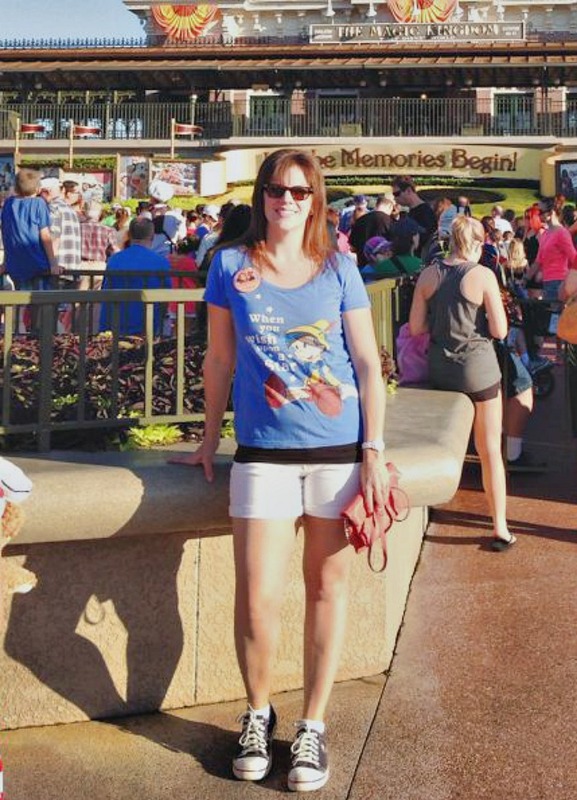 In fact, my favorite thing to wear at the parks are dresses with shorts. When it comes to theming at Epcot, I have fun with the world traveler aspect. Or if there is a festival going on, I may play that up, like this year at the International Flower and Garden Festival. 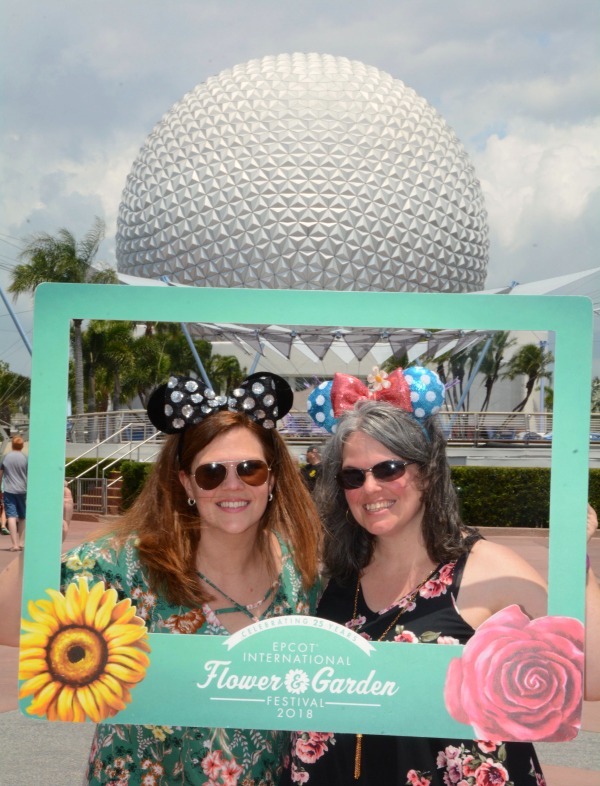 I love that our floral outfits matched the frame so well! Such a fun surprise. 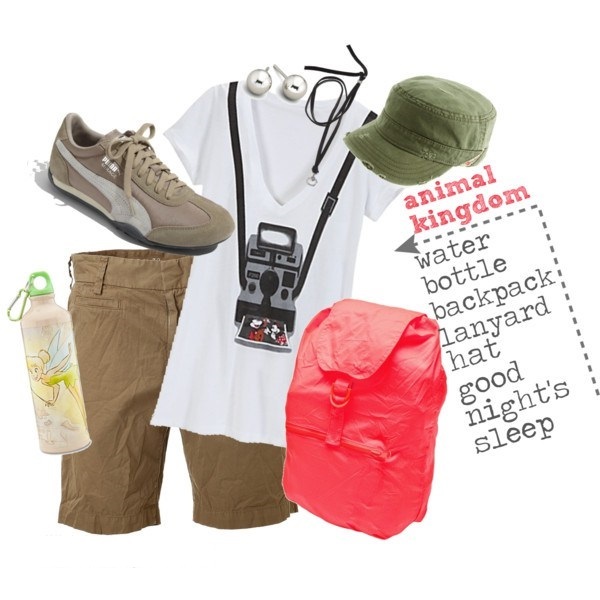 Animal Kingdom Park is another great opportunity to theme your clothing. This is a great park for “Disney Bounding” which is basically creating an outfit that pays homage to a location or character without being in costume. You could go with a safari theme or animal prints. Or if you want to bring characters into it, check out themes from the movie UP, The Jungle Book, or of course AVATAR. Or you could stick to a prehistoric theme. There are so many options. If you plan to enjoy the Kali River Rapids attraction in this park, you may want to bring a change of clothes or ponchos to wear (and sit on!) during the ride, because you WILL get wet. For the kids: This is a great park for kids because there are lots of amazing animals and plants to look at. The Boneyard is also a great place to play, but the dig area is very sandy so you may want to think about wearing Crocs when you visit this park so you can shake them out easily! Hooray for Hollywood! Man I feel like the options are endless for fashion at Disney’s Hollywood Studios. Not only do you have the classic Hollywood theme to play off of, there is Toy Story Land opening this year and with the current and upcoming Star Wars attractions, endless opportunities for fashionistas from a galaxy far, far away. I love bright colors and characters for this park. In fact, I’m pretty much always in SOME kind of character shirt when I visit. It’s just a fun place to be! 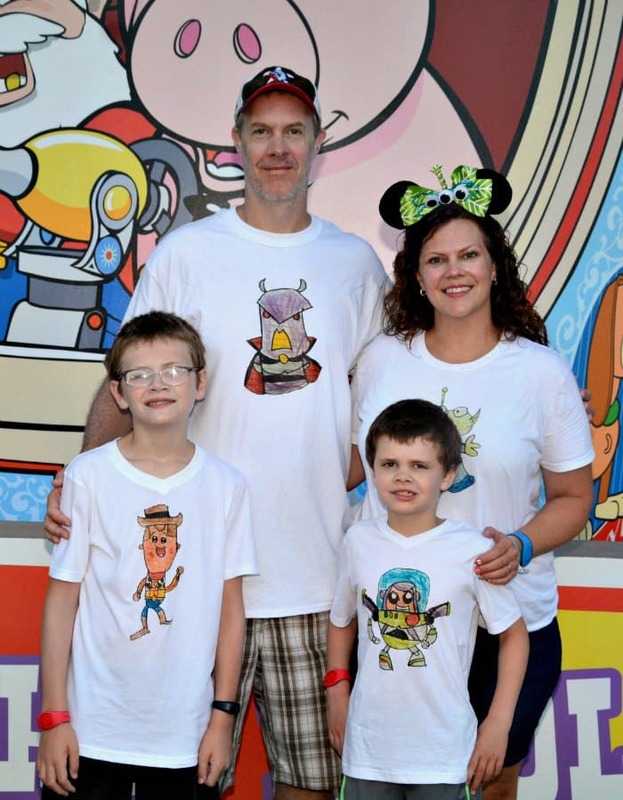 In fact, we made some fun Toy Story shirts for our first visit to Toy Story Land and I love them! You can see more photos and my DIY instructions here. 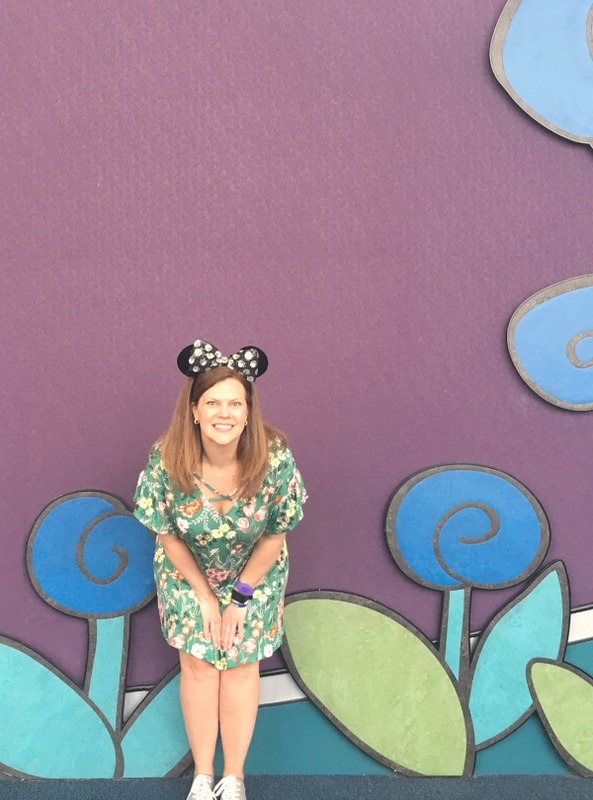 For the kids: Disney’s Hollywood Studios is a great place for Disney Junior fans so if your little one loves Mickey Mouse Clubhouse, Sofia the First or Doc McStuffins, be sure to break out the character gear! Not only does it make for fun photo opps, but the characters love it when they see their likeness on a shirt. It makes for some really fun interactions! What? Nightlife at Disney World? Really? Oh yes, my friends it’s a thing! From the Resort lounges to Disney’s Boardwalk to Disney Springs, there is plenty of late-night action! You can always go with some fun graphic tees like the ones below or dress it up. 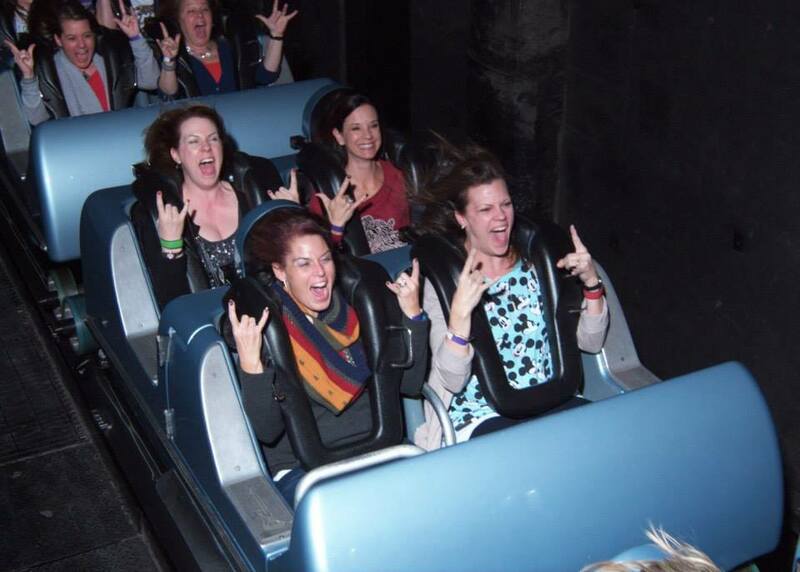 Let me just say, you are completely free to stay right in the clothes you wore to the parks. But if you’re looking for a night on the town and want to be a little fancy, go for it! 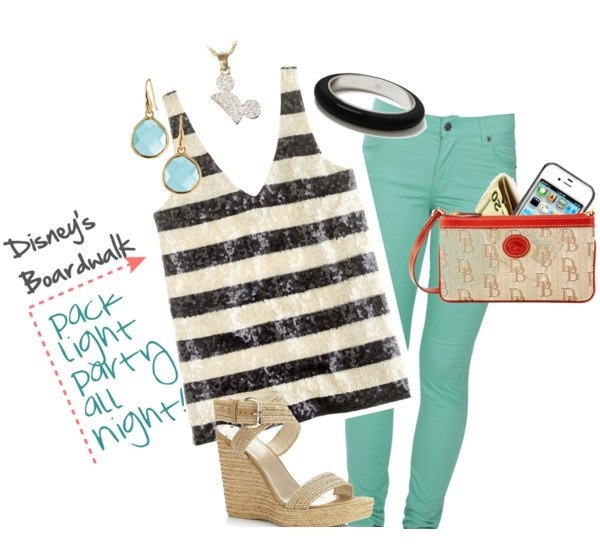 Throw on that Mickey jewelry and some fun (but still comfortable – be serious) shoes and go to the ball! Just remember, this is still Florida and just because the sun goes down, it doesn’t mean the temperature does. At all. Pants are probably going to be fine at night, but I would still stick with a sleeveless or strapless top and strappy sandals. For the guys and kids: Jeans and a button down or polo with flip flops will be perfect. If you really want to be cool, go for linen! Vacation isn’t vacation without at least one day at the pool right? I know I probably don’t have to tell you what to wear to a Disney pool, but I do have a couple thoughts. For the moms: Make sure your suit is comfortable and you can move in it. I love laying out as much as the next girl, but when I’m on vacation I want to be in the water and on the water slides! This is no time for triangles. Trust me on this. I’ve actually been loving the selection of swimwear at Target the past few years so don’t feel like you have to spring for the expensive stuff. For the kids: My boys don’t really do rash guards here but I always have them at Walt Disney World because we tend to stay out longer and it’s so much easier to reapply sunscreen when I don’t have to cover their entire chest and back. Call me lazy or a genius. But I think you know what needs to happen here. For everyone: If your water days include water parks, skip the fashion and go straight for the water shoes. Pavement gets SO hot at the water parks and it’s really rough on your feet when you’re there all day. Finally, did you notice what item every single photo included? 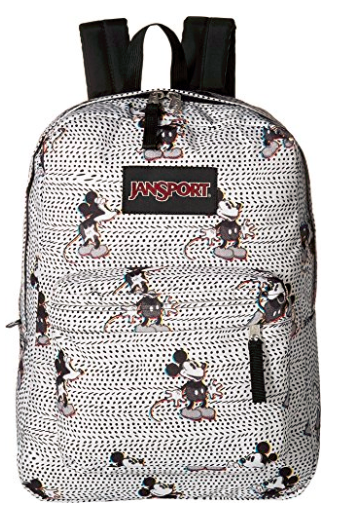 If you guessed backpack, you win! If you are traveling solo, you might be able to skip this. But for families, the backpack is essential for park days. Fill it with bottles of water, ponchos or packable rain jackets, extra sunscreen and chapstick, autograph books, sharpies, and a first aid kit for minor needs like blisters or splinters. Want to know exactly what I bring for my little ones? 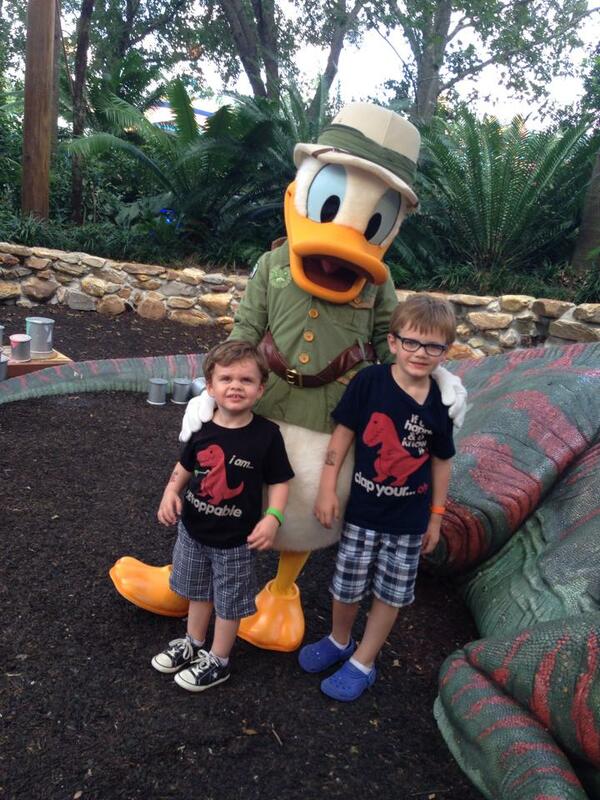 Check out my essentials for a day in the parks with kids. 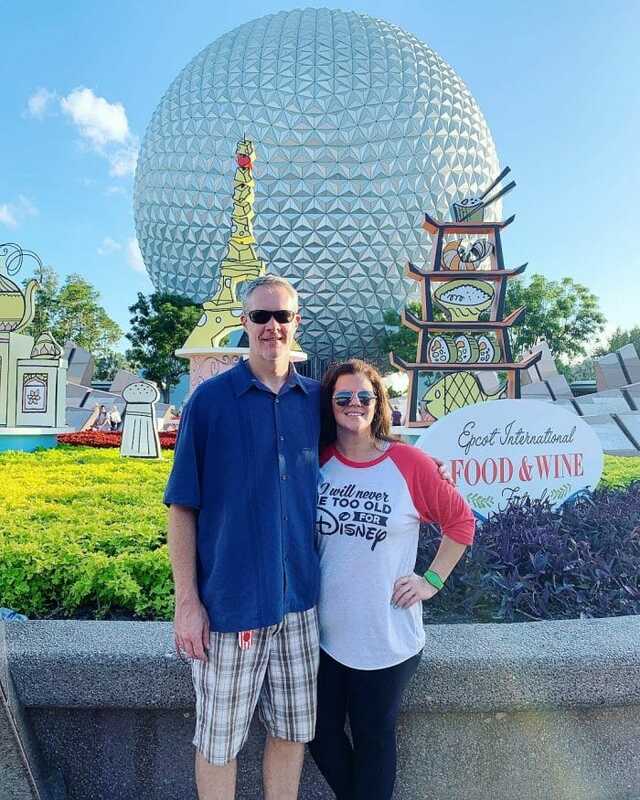 I love getting creative with our outfits when it comes to Disney vacations because the magic of Disney doesn’t have to be limited to the parks. That’s what makes it so fun as a Guest. We all get to participate if we want to. And I want to! With these fun and comfy ideas, packing is simple. When you’re dressing for warm weather, clothes don’t take up as much room so roll those dresses, throw in an extra pair of sandals and get ready to play!